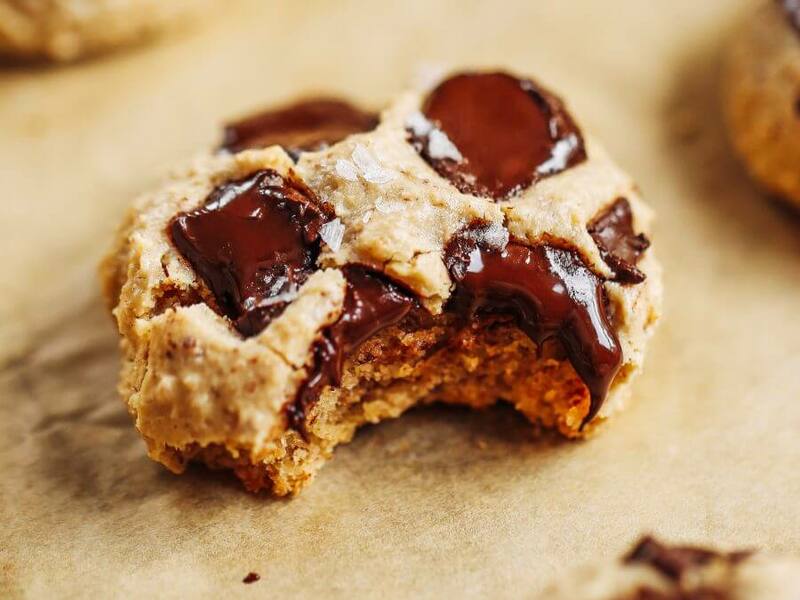 Paleo chocolate chip cookies made with hazelnut flour. Thick and soft cookies with gooey chocolate in the center. An easy paleo cookie recipe for dessert time! You can even make ahead and freeze for later. Preheat oven to 350F. Line a baking tray with parchment paper. In a mixing bowl combine butter (or coconut oil), coconut sugar, tahini, egg, and vanilla until smooth. Then add rest of ingredients (except chocolate chips) and whisk until combined. Stir in chocolate chips and use a medium size ice-cream scoop to form about 18 cookies (approximately 2 baking trays). Bake on 350F for 10-12 minutes, then cool before serving. Nutrition Facts Paleo Chocolate Chip Cookies Amount Per Serving Calories 170 Calories from Fat 117 % Daily Value* Total Fat 13g 20% Saturated Fat 4g 20% Polyunsaturated Fat 0.2g Monounsaturated Fat 2g Cholesterol 21mg 7% Sodium 20mg 1% Potassium 4mg 0% Total Carbohydrates 13g 4% Dietary Fiber 2g 8% Sugars 9g Protein 3g 6% Vitamin A 3% Vitamin C 1% Calcium 3% Iron 5% * Percent Daily Values are based on a 2000 calorie diet. Paleo chocolate brownie cookies! Easy fudgey chocolate brownie cookie recipe made with almond flour. 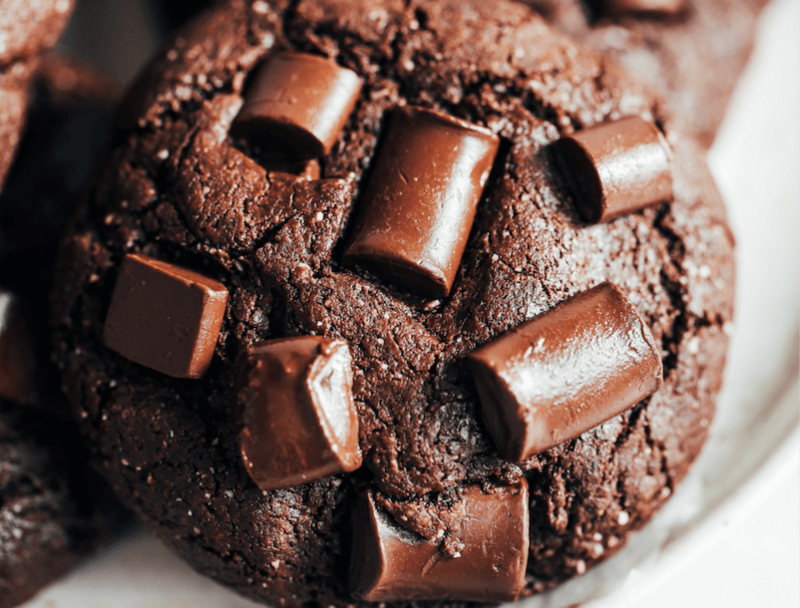 These double chocolate cookies are so easy to make, rich, decadent, and all the chocolatey goodness!!! Preheat oven to 375F. Line a baking tray with parchment paper. In a bowl whisk together coconut sugar, tahini, melted chocolate, and egg. Then stir in the rest of the ingredients (except chocolate chips) until smooth. Add chocolate chips and make 8 cookie dough balls, set them on the baking tray, pat down slightly and bake on 375F for 10-12 minutes. Then cool slightly before serving. Nutrition Facts Chocolate Brownie Cookies Amount Per Serving Calories 201 Calories from Fat 126 % Daily Value* Total Fat 14g 22% Saturated Fat 3g 15% Polyunsaturated Fat 0.1g Monounsaturated Fat 3g Cholesterol 23mg 8% Sodium 232mg 10% Potassium 50mg 1% Total Carbohydrates 17g 6% Dietary Fiber 4g 16% Sugars 10g Protein 6g 12% Vitamin A 1% Calcium 7% Iron 10% * Percent Daily Values are based on a 2000 calorie diet. Easy homemade brownies with a fudgey middle and crispy delicious corners. These gluten free brownies are family favorites- filled with rich chocolate flavor and made with healthy ingredients! Best flourless brownies made with sweet potato instead of flour! Preheat oven to 325. Line a 6" square baking dish with parchment paper. You can also use a 8" baking dish, but the cooking time will be less, because the batter will be more spread out more, so watch the cooking time. In a food processor combine ingredients (except chocolate chips) until smooth. Then stir in chocolate chips by hand or save for later and sprinkle on top before baking. Pour batter into a 6" baking dish lined with parchment paper and bake on 325F for 25 minutes. Then remove and allow to cool to set up before serving (they will hold together better this way). 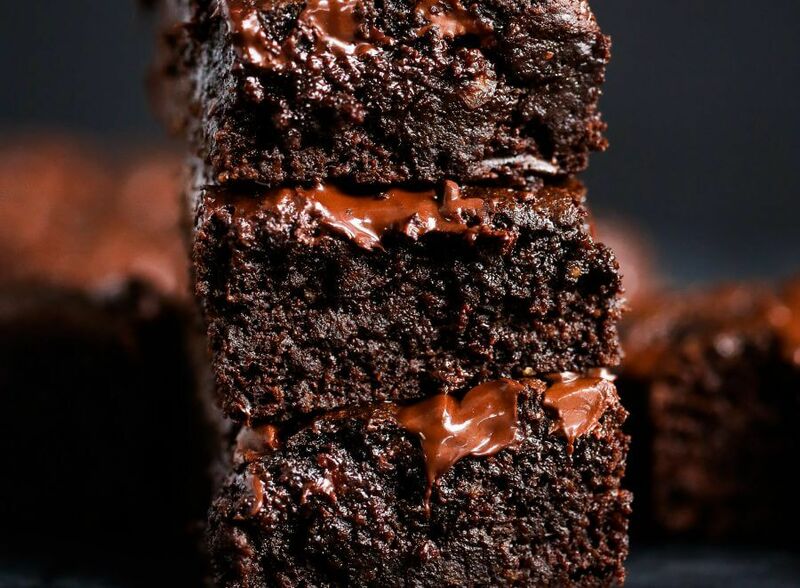 Nutrition Facts Best Homemade Brownies Amount Per Serving Calories 244 Calories from Fat 126 % Daily Value* Total Fat 14g 22% Saturated Fat 6g 30% Polyunsaturated Fat 0.1g Monounsaturated Fat 0.4g Cholesterol 21mg 7% Sodium 86mg 4% Potassium 200mg 6% Total Carbohydrates 23g 8% Dietary Fiber 5g 20% Sugars 13g Protein 8g 16% Vitamin A 38% Vitamin C 0.5% Calcium 5% Iron 8% * Percent Daily Values are based on a 2000 calorie diet. 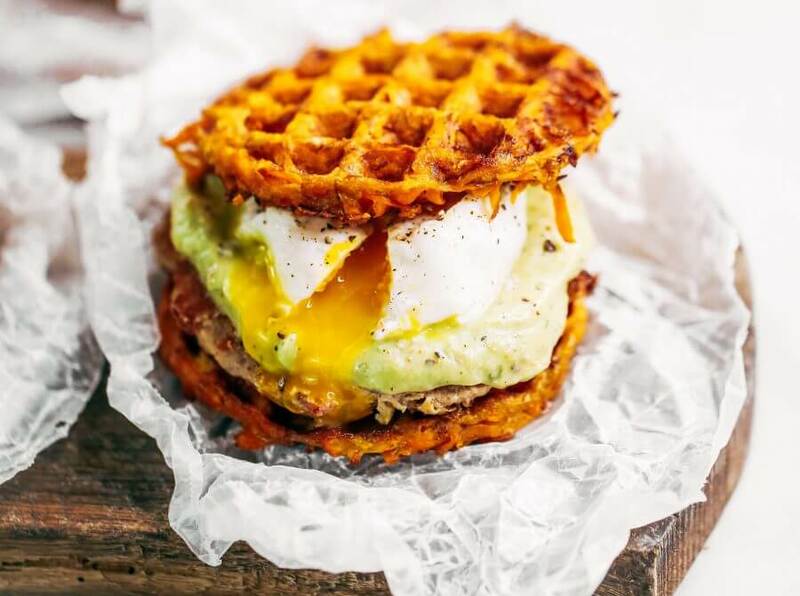 Bacon turkey burgers with avocado ranch dressing and sweet potato waffles! This whole30 breakfast is easy, delicious, and filling. If you’re looking for a healthy paleo breakfast burger recipe, this is it! Waffle Maker I use in this recipe- click here. 2 Ingredient Sweet Potato Waffle recipe- click here. Avocado Ranch Dressing- click here. In a bowl combine all ingredients until fully mixed. Heat a skillet over medium heat, drizzle lightly with olive oil, and use a large ice-cream scoop to form 8 patties. Press patties down with a fork on the skillet and cook until golden brown on each side (about 3-5 minutes on each side; I cover with a lid on the first side, then remove it when I turn them). You can choose to serve these patties with my 2 ingredient sweet potato waffles, avocado ranch spread, and poached eggs for a healthy breakfast, lunch, or dinner- see recipe notes for the recipes above. Nutrition Facts Whole30 Bacon Turkey Burger Amount Per Serving Calories 165 Calories from Fat 81 % Daily Value* Total Fat 9g 14% Saturated Fat 3g 15% Polyunsaturated Fat 2g Monounsaturated Fat 3g Cholesterol 82mg 27% Sodium 410mg 17% Potassium 184mg 5% Total Carbohydrates 2g 1% Dietary Fiber 0.3g 1% Sugars 1g Protein 17g 34% Vitamin A 1% Vitamin C 3% Calcium 1% Iron 9% * Percent Daily Values are based on a 2000 calorie diet. 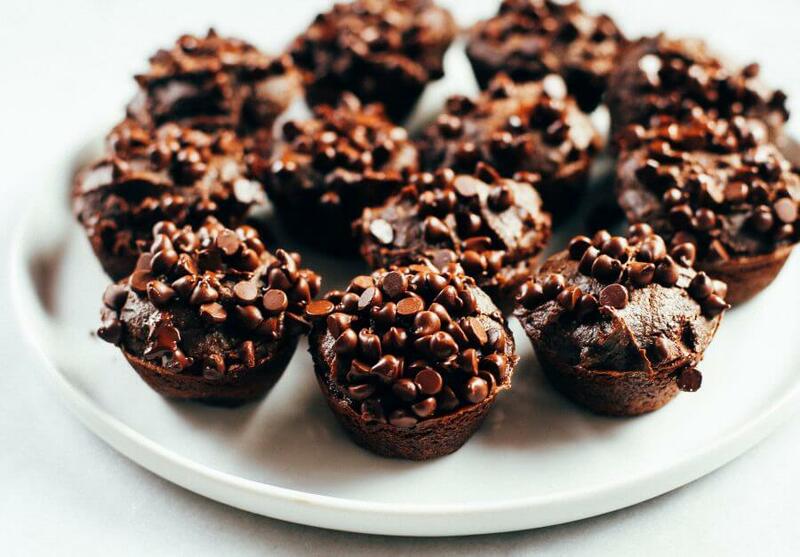 Avocado chocolate muffins that make for an easy paleo breakfast! Gluten free muffins made with almond flour and avocado. Kid approved muffins that taste like brownies! Preheat oven to 350F. Generously grease a mini muffin pan with coconut oil. In a food processor blend all ingredients until smooth (except chocolate chips). Use a small ice-cream scoop and fill the muffin pan with batter, then sprinkle with mini chocolate chips (optional) and bake on 350F for 25-30 minutes until a toothpick when inserted to the middle of a muffin comes out clean. Nutrition Facts Avocado Chocolate Paleo Muffins Amount Per Serving Calories 209 Calories from Fat 144 % Daily Value* Total Fat 16g 25% Saturated Fat 4g 20% Polyunsaturated Fat 0.2g Monounsaturated Fat 1g Cholesterol 16mg 5% Sodium 56mg 2% Potassium 116mg 3% Total Carbohydrates 15g 5% Dietary Fiber 4g 16% Sugars 7g Protein 6g 12% Vitamin A 1% Vitamin C 2% Calcium 5% Iron 7% * Percent Daily Values are based on a 2000 calorie diet. 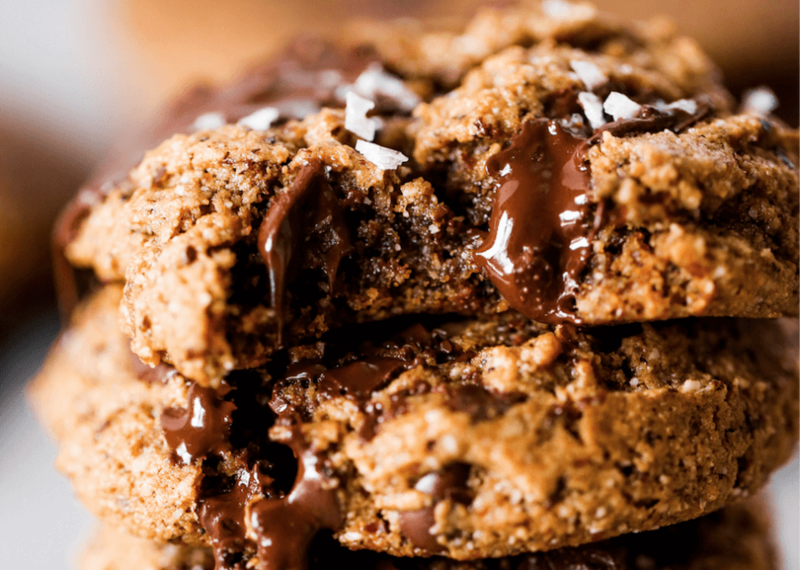 Print Recipe Almond Flour Chocolate Chip Cookies .. 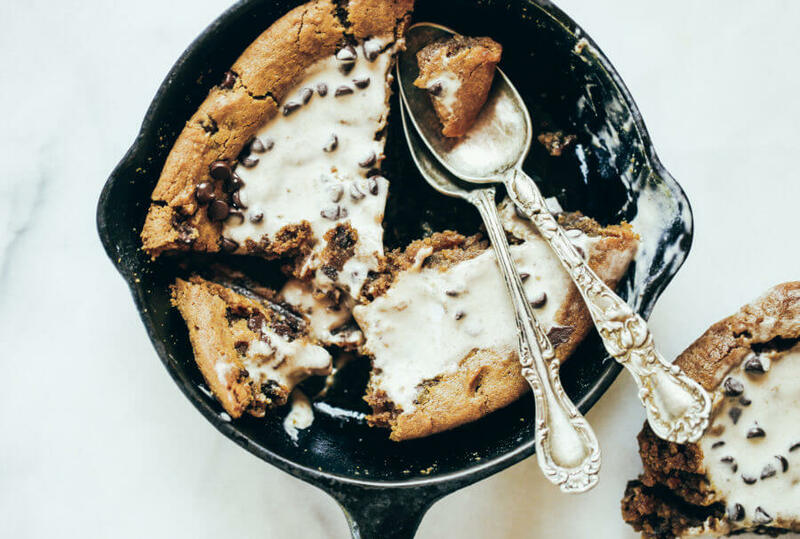 Healthy paleo cookie skillet made in 5 minutes in the food processor. The best gluten free chocolate chip cookie with a gooey inside and nice crust. Easy to make paleo dessert to share with friends! Preheat oven to 350F. Grease a 5-6" cast iron pan with coconut oil. In a food processor blend all ingredients (except chocolate chips) until smooth. Then stir in chocolate chips, pour into a 5-6" cast iron pan and bake on 350F for 20-25 minutes until golden. Allow to set before serving. 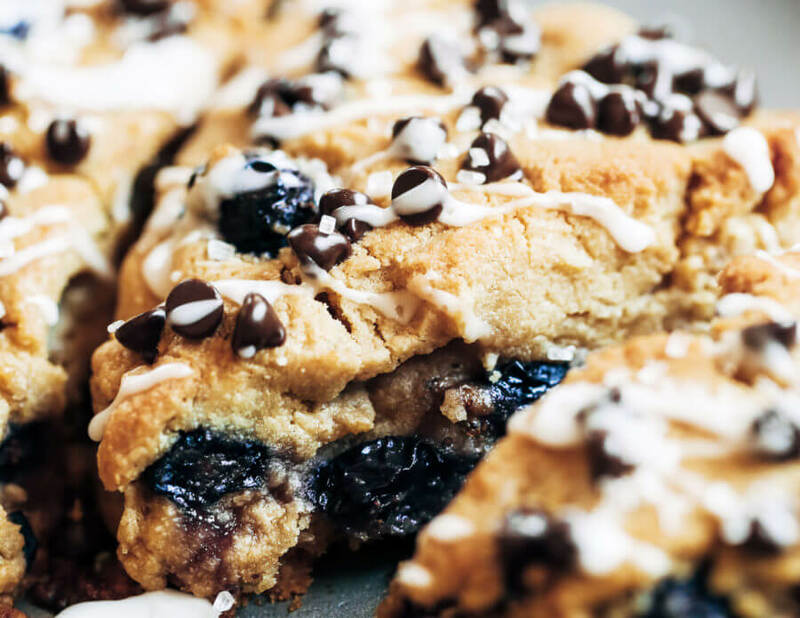 Nutrition Facts Paleo Gluten Free Chocolate Chip Cookie Skillet Amount Per Serving Calories 229 Calories from Fat 126 % Daily Value* Total Fat 14g 22% Saturated Fat 5g 25% Polyunsaturated Fat 0.1g Monounsaturated Fat 0.5g Cholesterol 31mg 10% Sodium 151mg 6% Potassium 10mg 0% Total Carbohydrates 24g 8% Dietary Fiber 4g 16% Sugars 15g Protein 5g 10% Vitamin A 1% Calcium 4% Iron 8% * Percent Daily Values are based on a 2000 calorie diet. 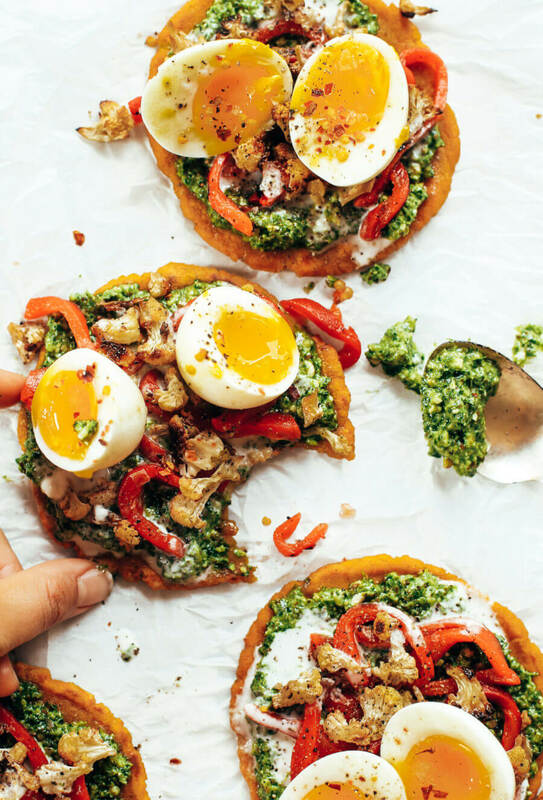 Nutrition Facts Kale Pesto Paleo Sweet Potato Pitas Amount Per Serving Calories 481 Calories from Fat 261 % Daily Value* Total Fat 29g 45% Saturated Fat 4g 20% Polyunsaturated Fat 3g Monounsaturated Fat 14g Cholesterol 233mg 78% Sodium 841mg 35% Potassium 1141mg 33% Total Carbohydrates 45g 15% Dietary Fiber 12g 48% Sugars 10g Protein 16g 32% Vitamin A 157% Vitamin C 246% Calcium 15% Iron 18% * Percent Daily Values are based on a 2000 calorie diet. 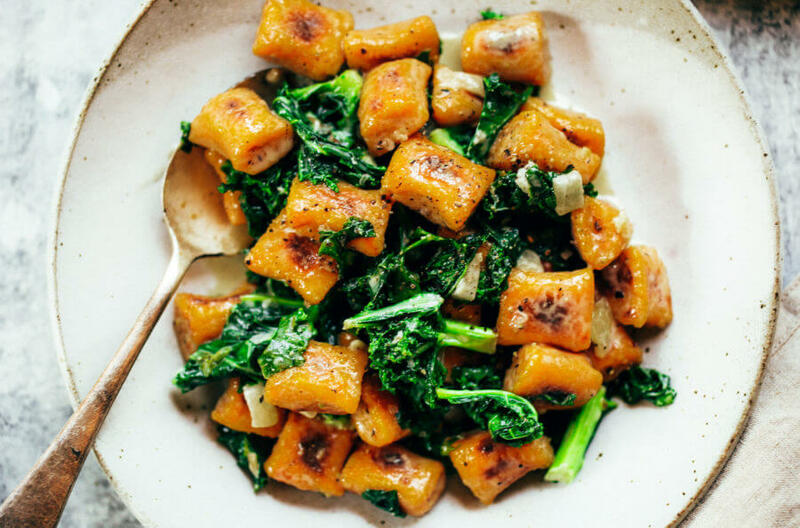 Easy paleo sweet potato gnocchi served with kale sage sauce. Delicious, healthy, family meal. Soft pillowy gnocchi made with sweet potato. In a food processor or bowl combine ingredients for gnocchi until smooth. If you don't have cooked sweet potato on hand, make it by peeling a large sweet potato, cutting into 2" chunks, and boiling in water until soft (drain water from sweet potatoes after boiling). Separate dough into eight equal parts and roll out into 3/4" diameter tubes on a surface dusted lightly with cassava flour. Cut the tubes of dough into 1" pieces. Heat a non-stick skillet over medium heat and drizzle with olive oil. Add gnocchi and cook on each side until golden, then remove. In a saucepan simmer ingredients for sauce for about five minutes. Add kale and wilt in sauce. Serve with gnocchi. 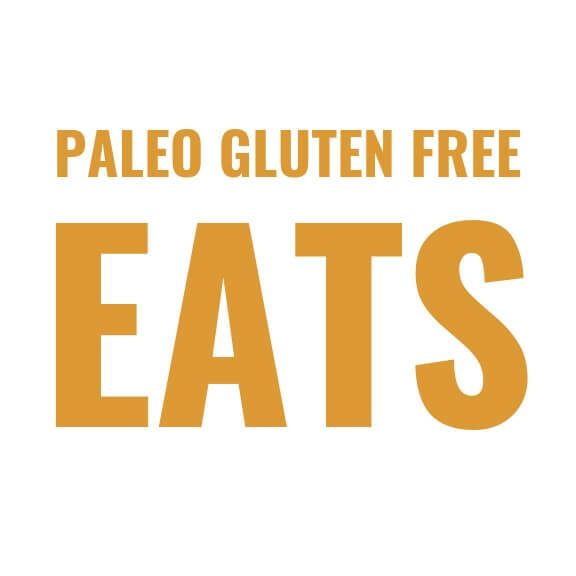 Nutrition Facts Paleo Sweet Potato Gnocchi With Kale Amount Per Serving Calories 287 Calories from Fat 135 % Daily Value* Total Fat 15g 23% Saturated Fat 12g 60% Polyunsaturated Fat 0.2g Monounsaturated Fat 0.4g Cholesterol 47mg 16% Sodium 798mg 33% Potassium 241mg 7% Total Carbohydrates 30g 10% Dietary Fiber 5g 20% Sugars 3g Protein 8g 16% Vitamin A 258% Vitamin C 106% Calcium 17% Iron 11% * Percent Daily Values are based on a 2000 calorie diet.